My thanks go out to Steve and Timi at MX Publishing for my copy of this book. You guys are a real blessing! The case of James Phillimore’s disappearance is mentioned in passing by Watson in THOR. He points to it as a case where Holmes felt that he had failed. Fortunately, this story reveals the truth about James Phillimore. James Phillimore lived near Holmes’ cottage on the Sussex Downs. As was revealed in the previous volume, Sherlock Holmes and the Woman, that cottage is currently occupied by Irene Adler. Irene has been to a local wedding. James Phillimore and family were also invited, but only Mrs. Phillimore arrives. She waits until after the wedding to explain that her husband has gone missing. They were ready to come to the ceremony, but he went back into the house for his umbrella. When he didn’t return, she could not find him, and not knowing what to do had attended the wedding a bit dazed from her loss. This book is a welcome addition to Sherlock Holmes lore. 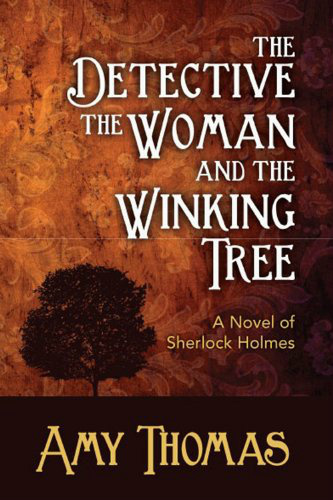 I fell in love with Amy Thomas’ version of Holmes in the previous book, and this one may be even better! A man is missing, and then discovered dead in his own carriage house by his little girl. Holmes investigates and is immediately dismissed by Inspector Graves, once an associate of Inspector Lestrade. Mrs. Phillimore states that her husband was being blackmailed by the local Doctor. However; Doctor Clarke is an old friend of Sherlock Holmes and dismisses the thought entirely. Holmes himself has thought the story a bit fishy. The Winking Tree is in the village square and was once used for secret letters between star crossed lovers. The tree was used for messages between Mr. and Mrs. Phillimore while he was missing. Now he has been murdered by persons unknown. The mystery winds through several different threads that seem unconnected. They are woven with care, making the final reveal a satisfying end to an excellent read! I sincerely hope that Amy Thomas adds many new volumes to a first rate series!